This last weekend felt like the real first weekend of summer. We hadn’t had three days of sun in a row since April. We took advantage by doing a lot of walking. 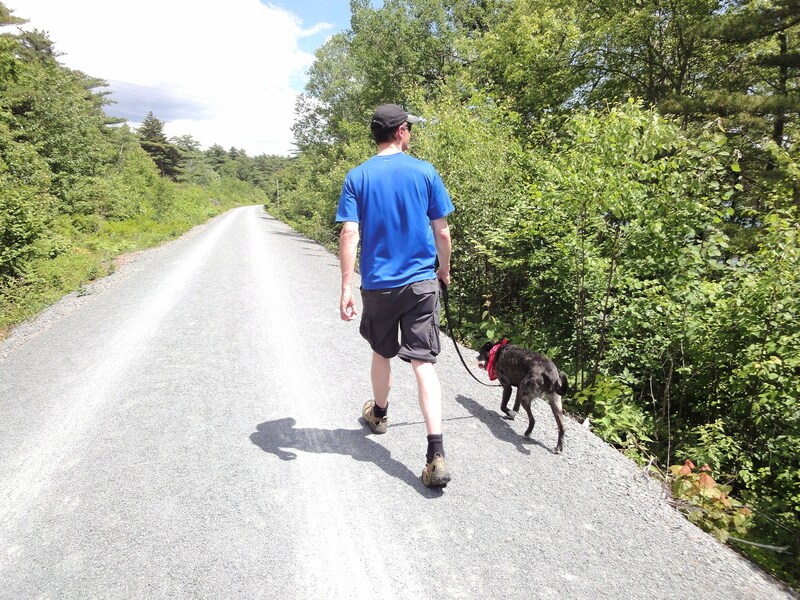 Halifax Regional Municipality has opened a few new trail systems around the city. They are highly accessible and great for cyclists, joggers, and Rollerbladers. It’s such a great idea and I’m glad our city is recognizing the need for recreational paths. Unfortunately, we were a little disappointed with the one we checked out on the weekend. Due to the location in a major industrial area, the trail itself is very flat and very straight. 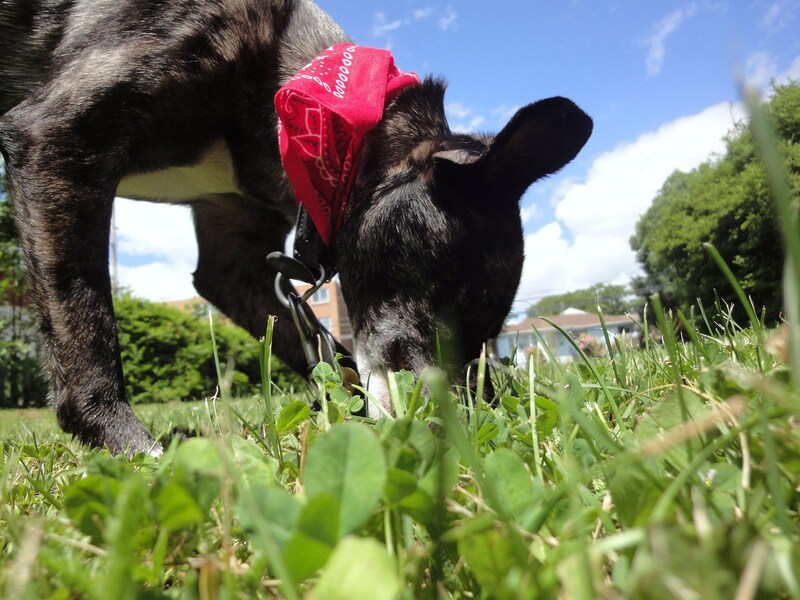 It’s too dangerous to let dogs off-leash and the immediate sides of the path offer very little for dogs to sniff. While I am glad we checked it out, I don’t think we’ll be back to this one. We’ll stick to parks with a view. 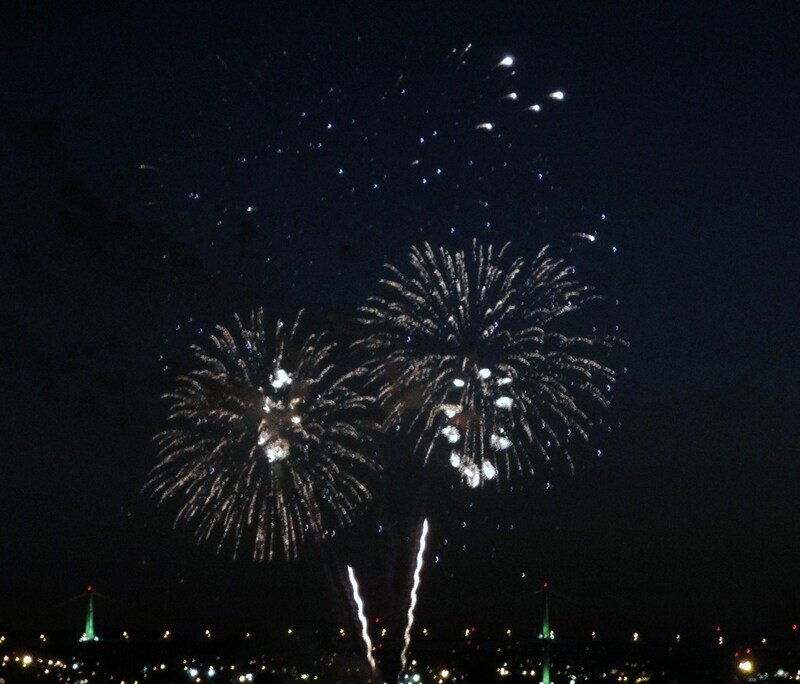 At least the Canada Day fireworks over the harbour more than made up for the loss. That industrial path looks like a good roller blade path. I wish I had some closer to me to use. I’m about to roller blade her at the train station parking lot because it’s been so long. Glad you all are getting some nicer weather finally. Well, on my visit to Halifax and drive through Nova Scotia, all I remember is the pristine countryside and quaint houses. Bummer they couldn’t put the trails through a nicer area. I suspect that municipal trail is much more for bicyclists than for dog walkers. But looks like you’ll have plenty of other nice places to walk. Hope you get at least a few more nice days to enjoy them. There are so many other amazing places. We just thought we’d try something new. The trail only opened a few weeks ago. Thanks. I hope you are having some beautiful summer weather as well. Shiva is too cute! Love the last picture! glad you got to take advatage of some great weather! Walks by the water are always preferable to those in an industrial area! Heh, I could not agree more. 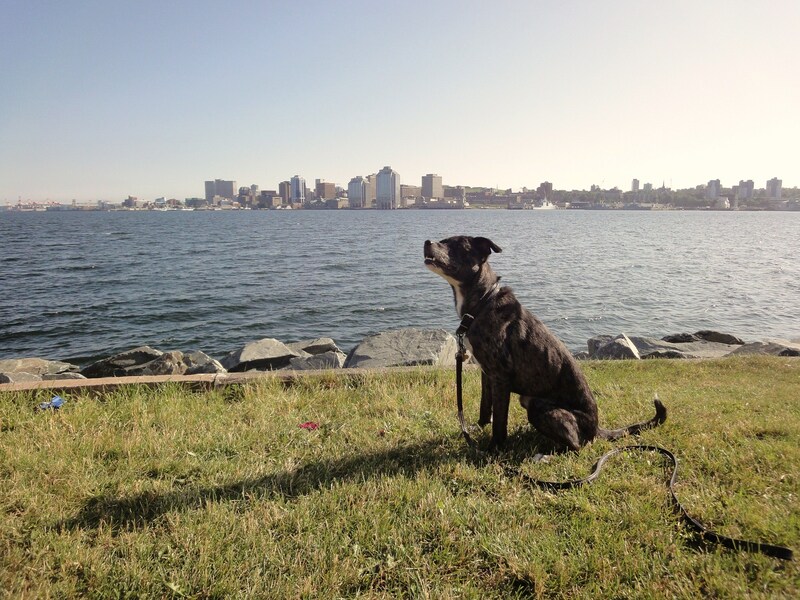 With so many lakes, Dartmouth is actually known as the city of lakes, we don’t need to waste our time walking around some dirty buildings. We went to the park yesterday, and while we stayed in the shade and drank a lot, I almost had heat stroke. I can’t imagine the humidity is worse here than in Halifax– you’re on the ocean! Yikes, you’d better be more careful! When we go for hikes or long walks I always take a backpack with water for us and for the dog. Next time, though, I need to remember a hat as I burnt part of my scalp. Oops. The humidity isn’t so bad. I actually prefer it to Alberta’s incessant dryness. Looks like a good time was happening fur sure! Beautiful photos Kristine! Seriously gorgeous. That’s so great that more walking paths are available to now. Bummer about this one not being so great, but at least now you know! Aww, thank you. I guess this camera isn’t so bad after all! Exactly, that’s how I look at it. At least there are plenty more and when in doubt, there is always the beach! Thanks! I hope you enjoyed your Independence Day. Though judging by all your bright photos, I’d say that’s a safe bet! You are so lucky to have the walks. The farm track walk that Song and I enjoy is actually private land, but the farmer doesn’t mind as long as you keep off his fields. I love that about the UK. I remember taking many walks over private land when I was there for a summer. It always surprised me when no one minded. You are lucky to live in such a beautiful place as well. Yeah, that one trail looked kinda boring! But like you said – good that you checked it out. The Canada Day fireworks looked impressive! They weren’t as long as I expected. They were going off in two parts of the city and the ones further away actually looked better. It was still great to get out. We haven’t done that better in Halifax. Isn’t it great to get some sunshine, it’s been the same for us in BC too, I feel energized 🙂 The top pic is so cute – the red bandana really suits Shiva! You are Canadian as well! I totally forgot. I am going to need to make a real list so I don’t leave anyone out next time. I like the red on her too. 🙂 It was a compromise as the husband didn’t like the pink one I previously got for her. Silly boys. Looks like a wonderful time! Didn’t you find wild blueberries on the path? That would have made things a little less disappointing. I didn’t even think to look! I think it might be too early for blueberries… Now I am wondering… Dang! I’ll have to check the next time we go for a walk! I can’t wait for our summer to be over so we can hike! Too warm in Vegas for any real walking? That’s too bad. Though I guess you don’t really get a winter so I can’t feel too sorry for you! It does look a little dull, but maybe it’s meant to be more multipurpose. Not that that makes it any more fun, but it might explain it. Your fireworks were beautiful! It probably is. It’s great it is so accessible. 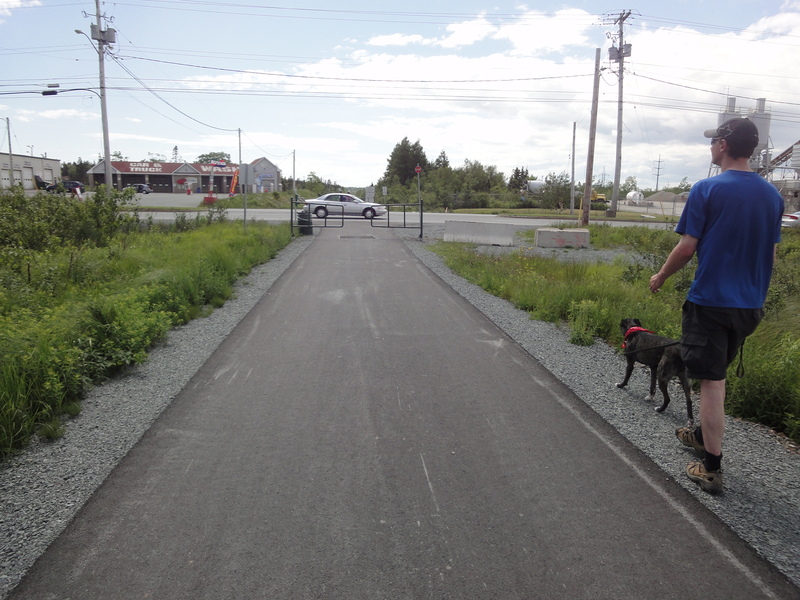 Most of the paths in the HRM are not wheel-chair friendly, this one definitely is. That’s a bonus for sure. Thanks! I am glad we got to get out this year. What a gorgeous harbour! I haven’t been to Halifax in like 10 years, almost forgot how very beautiful it is. One of these days! One of my dream trips is actually to road trip across Canada. I definitely need to spend more time in the Maritimes, I love the beauty and the atmosphere. It all seems so much more laid back than Vancouver! The trail didn’t offer much sniffing, but the firework shot was gorgeous. Thanks! Oddly, I actually tried the fireworks setting at first but it didn’t work at all. Just made everything blurry. I am glad you like it! Great pix. I love fireworks, we seem to have them all the time here…Independence Day, Christmas, New Years Day, Father’s Day, a recent boat regatta, and lots of special events. We need to do more walking path type walks, though we do like your view! love the bandanna on shivs. there seem to be quite a few dogs wearing them over the long holiday weekend. [at least on the blogs.] is it a tradition of some sort? Thanks for your comment on my blog. I struggle with perfectionism all of the time, I am glad not to be alone, because I feel the same way when I hear/see about all of the accomplishments you have made with Shiva. Especially the behavior issues and agility. I am always stung with a little jealousy when I read about the next great thing you have taught her. Thanks Kristine, for letting me know I am not alone. I appreciate your honesty. I love her cool look with that red bandana around her neck. Red’s definitely her colour! Glad to hear that the weather’s turned your way.